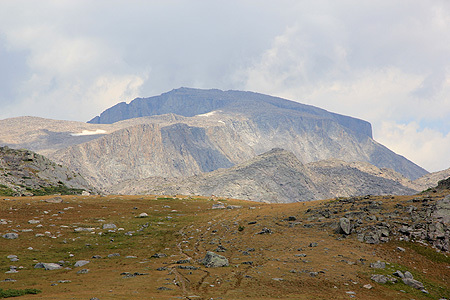 This peak is located in Bighorn National Forest, north of Casper, Wyoming. That is, locate Buffalo, where I-25 (from the south) hits I-90. Locate Hwy. 16 going west and follow this road approximately 46 miles. Drive past Meadowlark Lake and continue (a short distance) to Deerhaven Lodge, where a road forks right. Follow this road (good dirt) as it heads uphill and eventually serves West Tensleep Lake trailhead (there are signs). This is the trailhead, location N44.26168, W107.21284, elevation about 2790 meter. 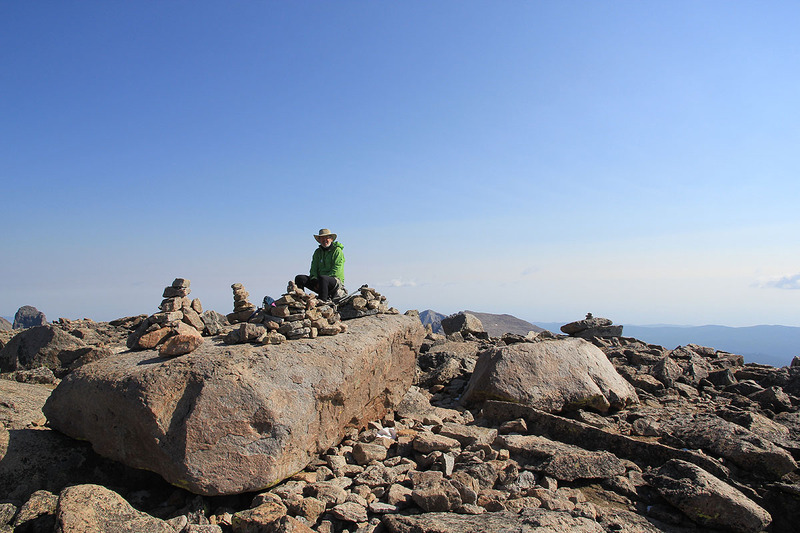 This hike is about 36 kilometer round trip, thus most parties will plan it as a 2 day trip. There is a self registration point at the trailhead. The trail is named Mistymoon Trail. 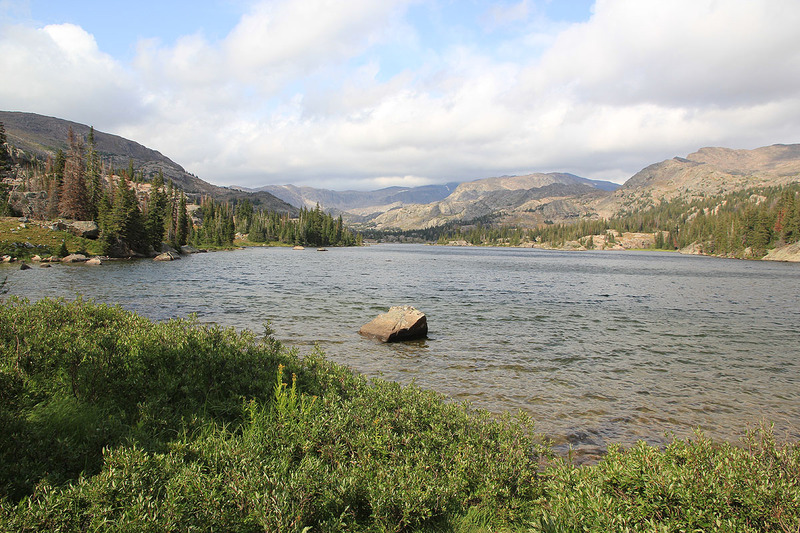 Stay left at early trail forks and hike north on the east side of West Tensleep Lake. Further north the route crosses the creek and continues north in the valley, while staying a bit west (left) of the creek. Another trail joins from the left side just before lake Helen. Continue past this lake and lake Marion to reach Mistymoon lake. 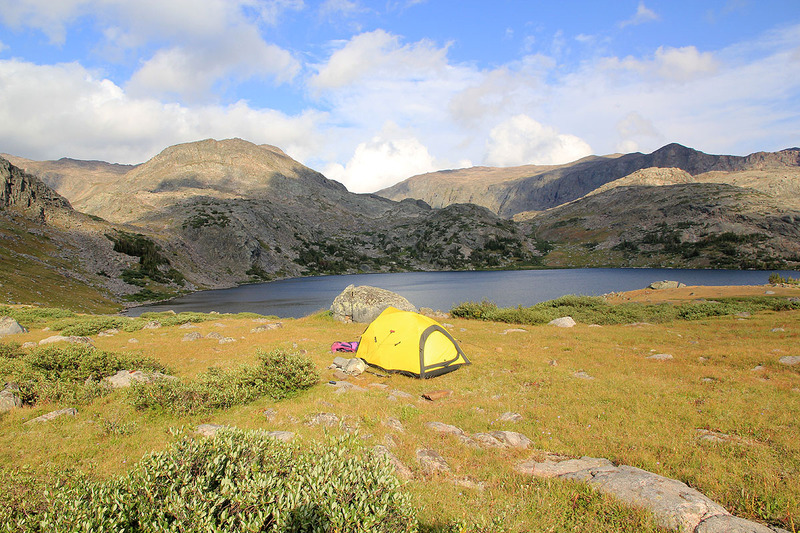 If the climb is planned as a 1.5 or 2 day trip, then this is a good place to camp. We camped here at location N44.34310, W107.21714, elevation about 3150 meter. You can see Cloud peak to the north-east from this spot. 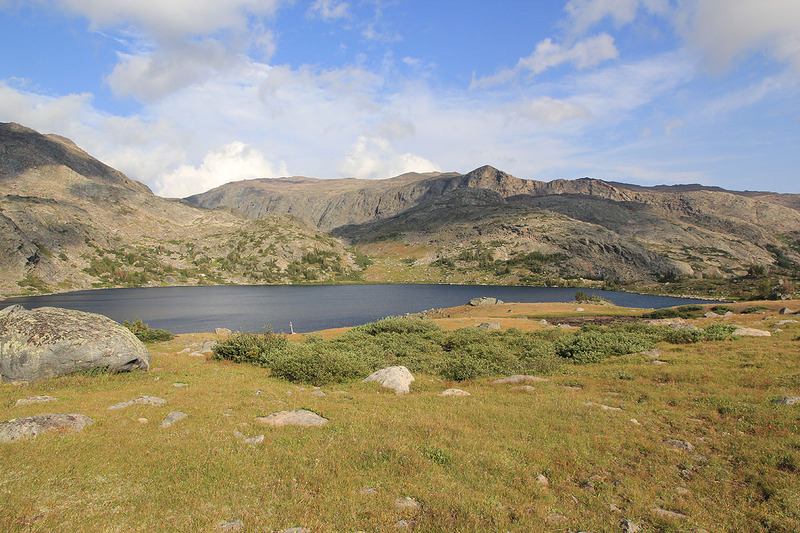 From the north-west side of Mistymoon lake, follow the clear trail that heads north-east and crosses a well defined saddle before descending more north-west. 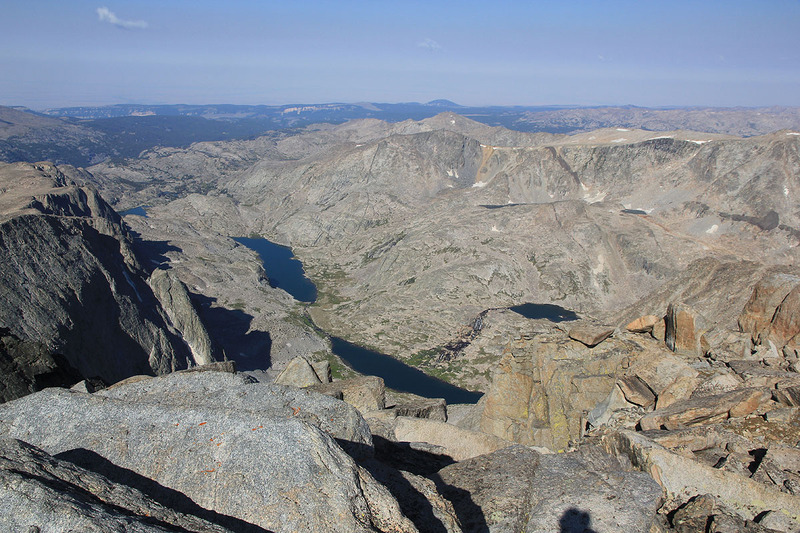 Pay attention here, as the route shall leave the main trail and descend more directly to the valley floor below. Look for a smaller trail that heads directly downhill at location N44.35018 W107.21466. Follow this trail down, then across the flat valley floor (directly north), crossing two creeks, the last one is named Rock creek. Turn more north-east and follow Rock creek on its left side as you slowly gain elevation. The trail may not always be very clear in this area, but the correct route has cairns leading the way. The route now continues uphill in the same general direction. 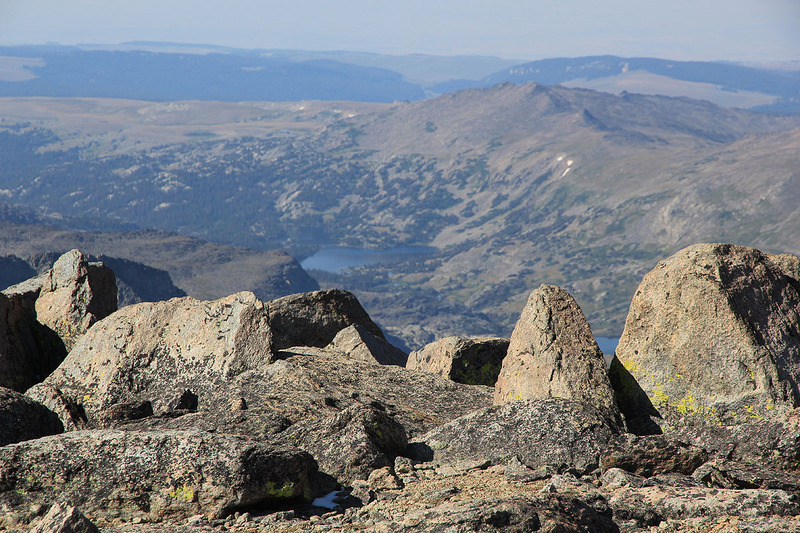 The cairned route generally avoids more cumbersome terrain and stays pretty center as you get higher. Eventually, this broad ramp narrows and the boulders are increasingly hard to avoid. Hop along, this ridge is never very narrow, then widens again before the final slopes leading to the summit plateau. 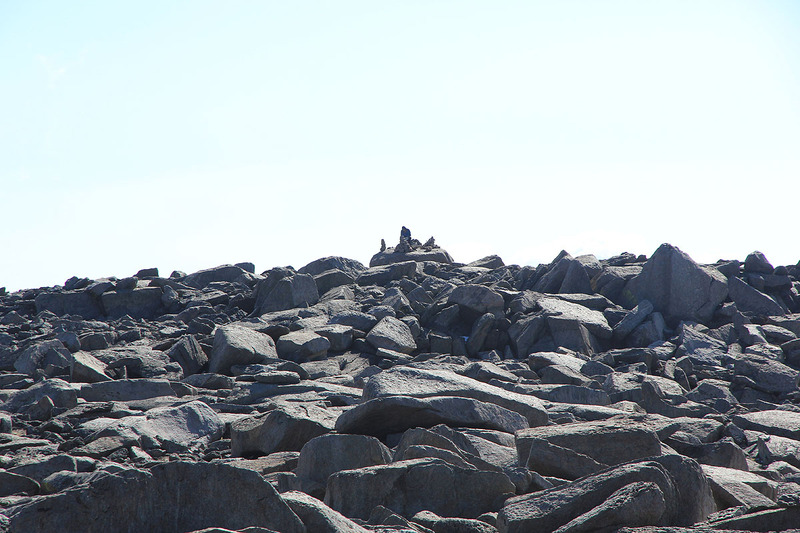 The summit area is pretty big, having its highest point on top of a large rock. 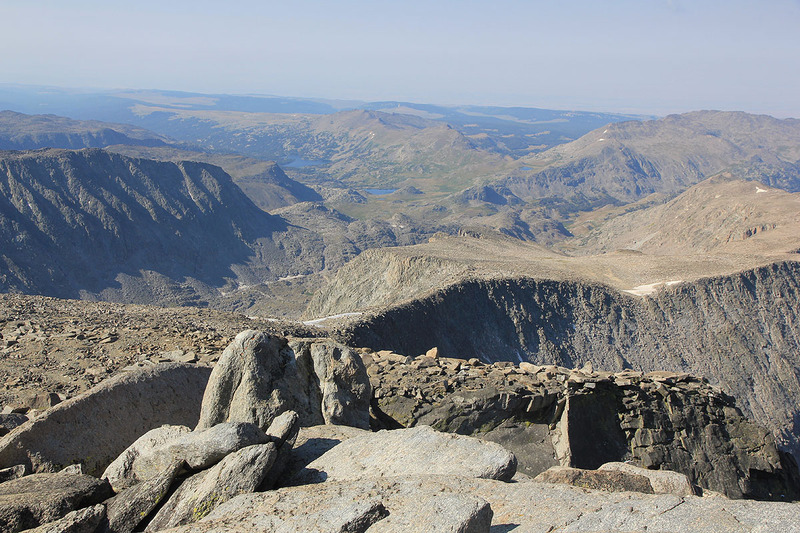 This picture, looking back from the summit, shows a large part of the route. The approach up the valley, lake Helen and Mistymoon lake, the crossing into the valley passing west of the first ridge, then coming up across talus and boulders to gain the summit. 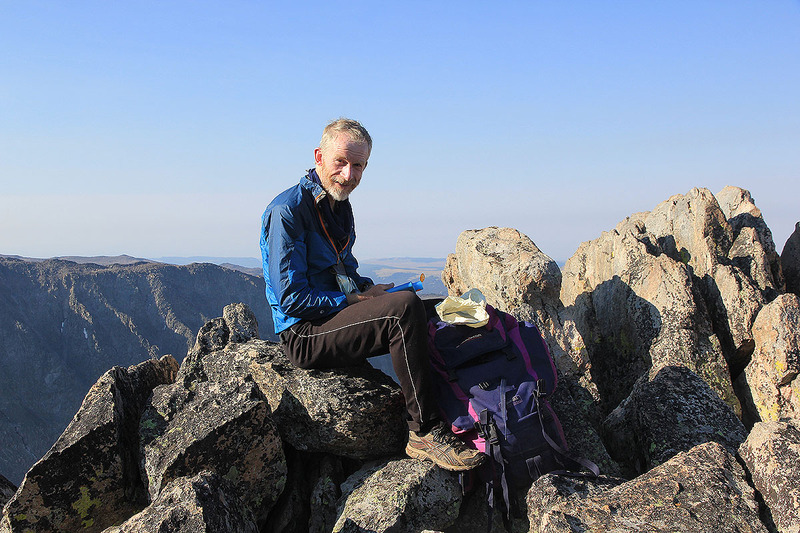 I did this hike with Rob Woodall. We came from Crazy peak having parted with Melanie and Eirik that now headed directly back to Norway. We started from the trailhead at 1430 and reached Mistymoon lake at 1710. 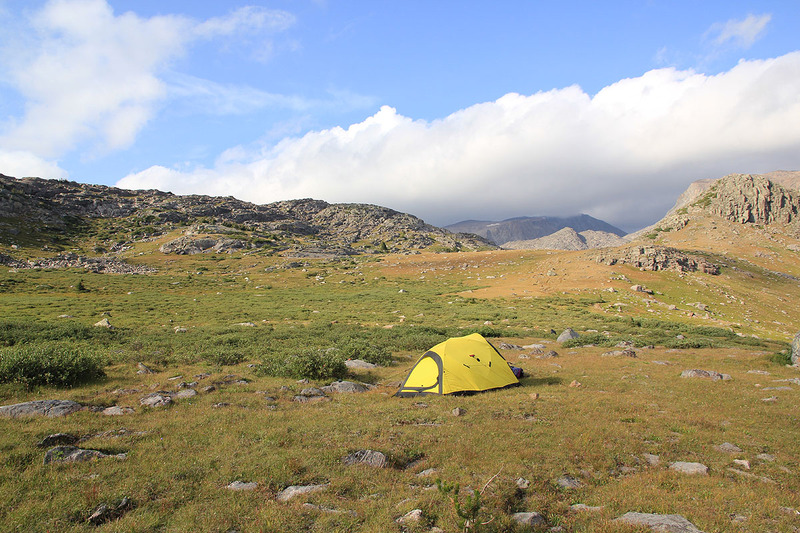 Here we established a nice camp and enjoyed the good scenery. We had seen quite a few people along the trail, obviously this is quite a popular area. The next morning, we started at 0540. It was quite cold (frost) and the weather stayed on the cold side for most of our morning ascent. We lost the cairned route on the slope above Rock creek, but the hiking was still reasonable as we got to the boulders where the ridge gets more narrow. From here, we could see the rest of the route to the summit. We gained the summit at 0930. Time for a small celebration as this was my 57th. and last ultra prominent mountain in the contiguous 48 US states. My first US ultra was Mount Whitney climbed in 1977, that is 35 years ago. However, I did not start climbing Ultras until 2004, so the majority of peaks have been visited over the past 9 years. 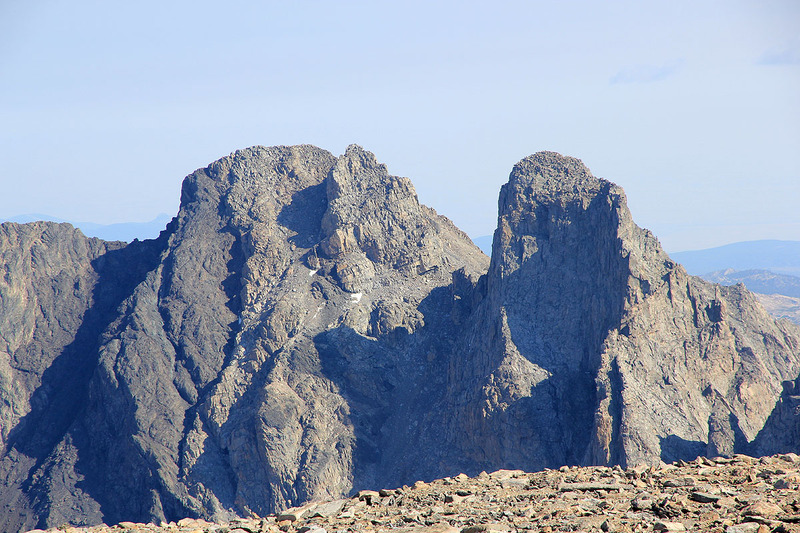 We looked at the nice view to neighbor peaks and I took a stroll to a sharper sub-summit that looked equally high. However, upon getting there, I could fairly certainly conclude that it was somewhat lower than the official highest point. We spent 40 minutes before starting on our way home. Leaving the summit at 1010, we return to our tent by 1320. The weather is still nice and the (forecasted) thunder will not bother us. We clear camp and leave by 1400. With a pretty steady pace, we are back at the car at 1630. 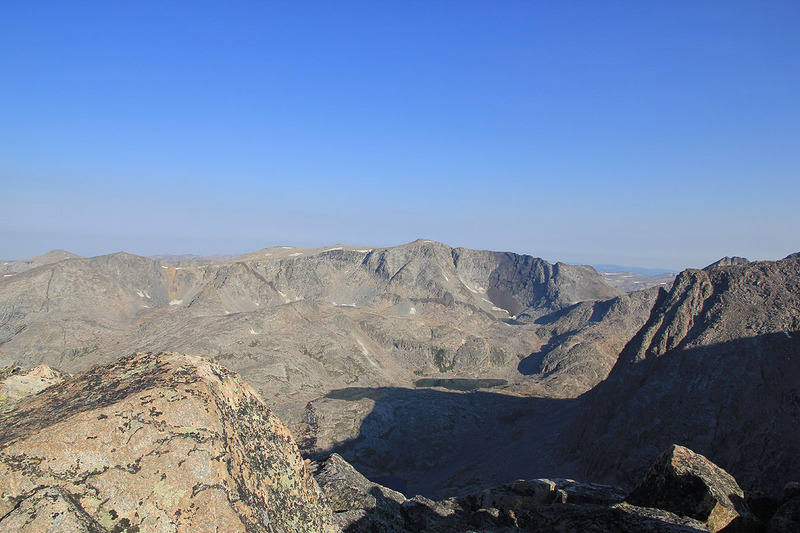 A very nice area, and a very appropriate hike to a worthy peak for completing the CONUS Ultra prominent peaks. This adventure has taken me to many different parts of the USA, perhaps the most attractive aspects of climbing peaks ranked by prominence. You get to experience a great diversity, not only of mountains, but also of landscapes, people and culture. Thanks to Rob, he has been a fun and valuable partner on two great trips to the north and north-west of the USA. We still had several more days before leaving. 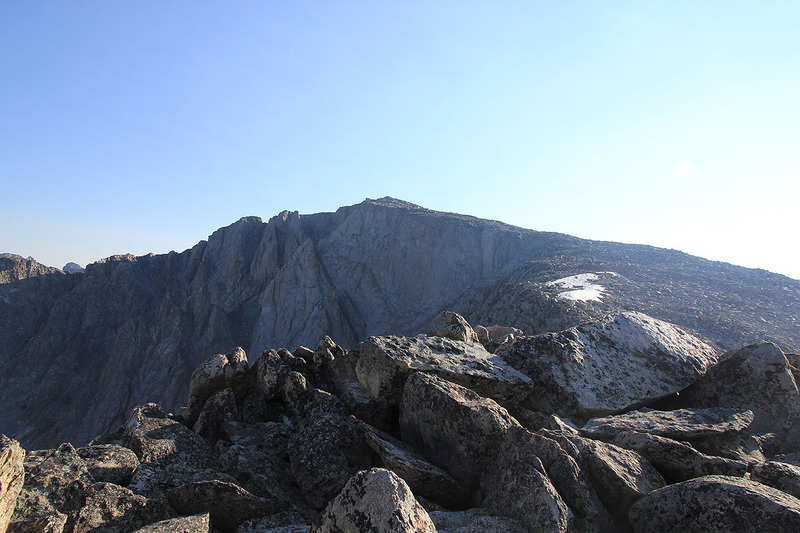 Originally, we planned to also climb Granite Peak in Montana, however, bad weather (rain with thunder and lightning) prevented us this time. 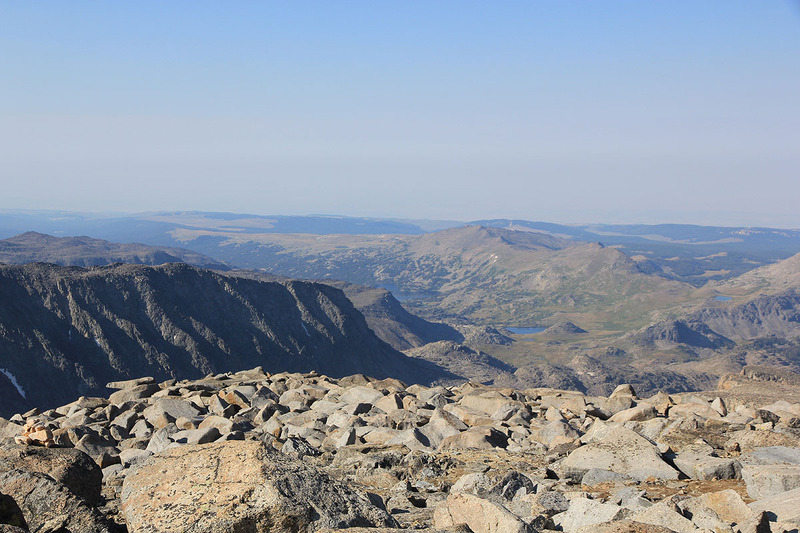 Instead, we travelled south and hiked several major mountains (P600m) in Colorado. 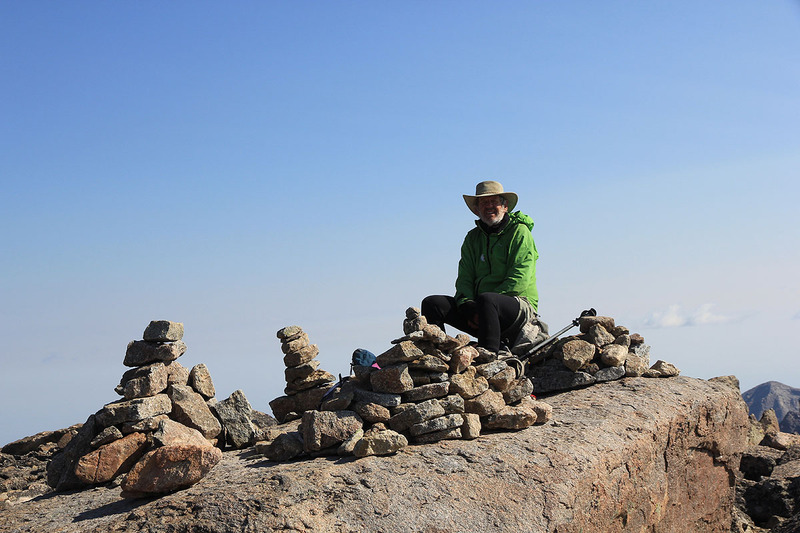 Me, on the summit of Cloud Peak, my 57th. (of 57) ultra prominent mountain in the (lower) 48 US states. 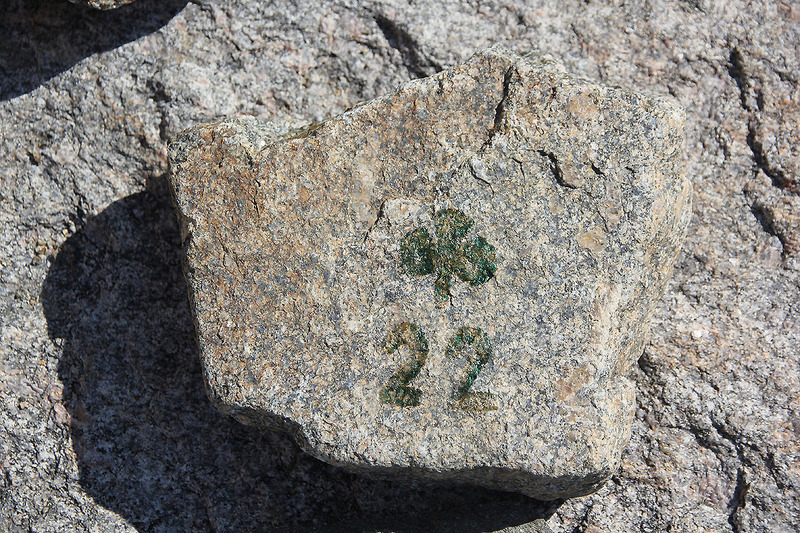 A symbol, printed on the summit rock. 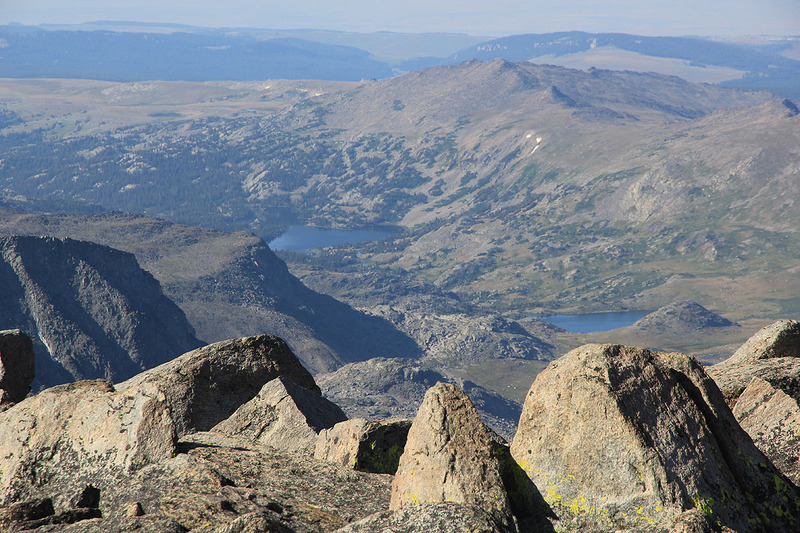 Helen lake and Mistymoon lake, as seen from the summit. 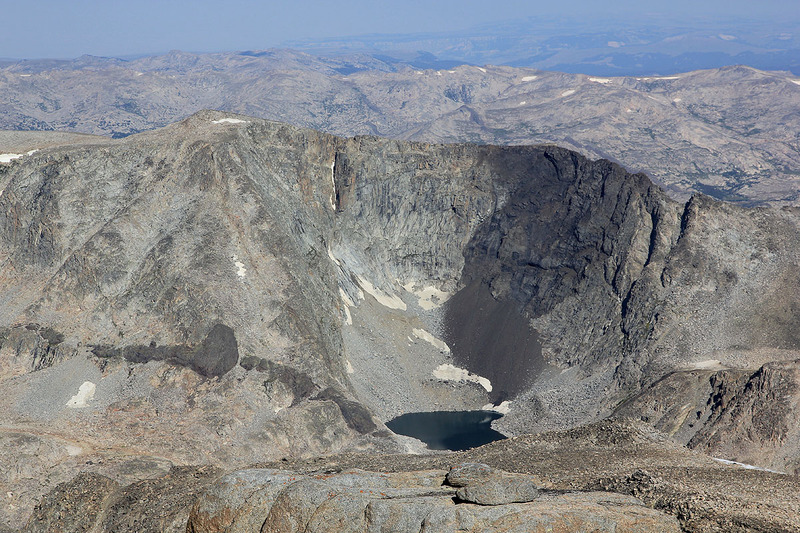 A small mountain lake, as seen from the summit.